I’m excited to have David Somerville as my guest this time. 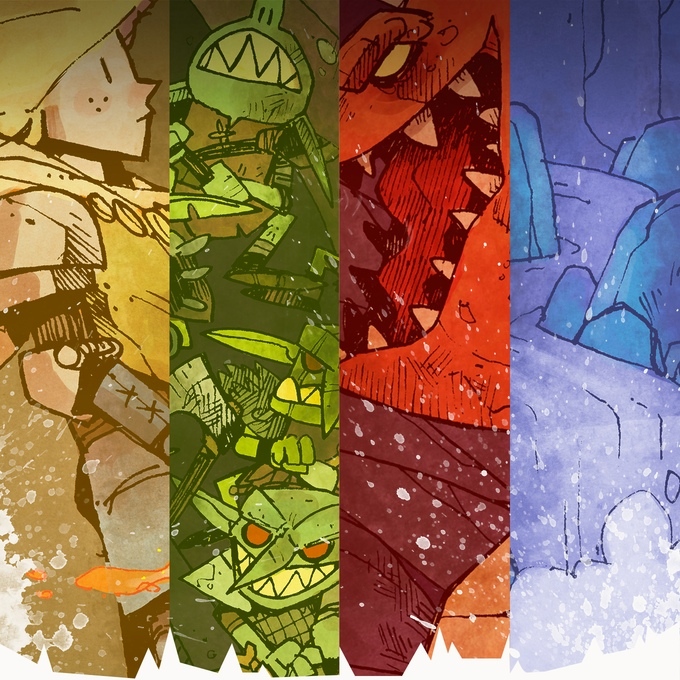 David’s game Trove: The Crystal Caverns is going gangbusters on Kickstarter right now. It’s a cool looking and sounding dungeon crawler with a twist. But I’ll let David tell you about it. Tom: Welcome David. First, tell us a bit about yourself. David: Sure! Well, I’m married to my breathtakingly gorgeous best friend and we have two crazy/beautiful daughters. We live in a little apartment right outside Washington, D.C., and go see Pixar movies when the air conditioning conks out. I’m a big fan of Radiohead, black coffee, scotch neat, Dostoevsky, and inauthentic Chinese food. And I like making games. Tom: Now let’s talk about Trove. David: Okay, so Trove: The Crystal Caverns is a super-asymmetric cave-crawling game. What that means is that 2–4 players sit down at the table, and each of them has a different role. 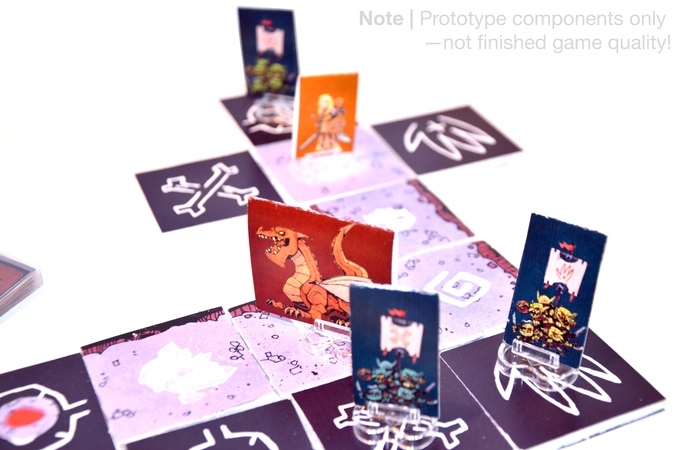 One player is the Knight who’s entering these caverns to kill the sleeping dragon. Another player is the Goblins who live in the caverns, and they’re trying to kill the Knight. A third player is the Dragon, who wakes up and is trying to fly out of the cave to escape the Knight’s sword and set fire to the kingdom. And then a player can be the Cave itself—alive, malevolent, trying to collapse in on itself and destroy all the living things inside! So, how this plays out is four very different sets of rules, pieces, play styles, and victory conditions. There’s no player elimination—the game ends when the Knight kills the Dragon, when the Goblins kill the Knight, when the Dragon escapes, or when the Cave collapses! Tom: The idea of playing as the Cave, the setting as a character, is pretty radical. How did you come up with that? David: It actually began as a symmetrical game where both players were constructing dungeons and sending parties in to raid their opponents. Then it became obvious that having an adventurer and a DM was more interesting than both players splitting those responsibilities. And finally, the Goblins were interesting enough as a group that I wanted to separate them from the Cave mechanics. Once I did that, and started looking at what the Cave could do if it wasn’t responsible for moving monsters around (deciding the shape of the rooms, throwing out events and traps), it all started coming together. Tom: Most designer try to avoid asymmetry. You are reveling in it. Why? David: I think asymmetry brings people together. If a game is symmetrical, it invites competition, comparison, stories about how you edged the other person out with a smart strategic play—and nothing’s wrong with those things. That’s how most games work, and I love games. But in an asymmetric game, you can bring people who like very different styles of gameplay together around one table. You can play without comparing your skill level to the person next to you, since you’re operating with a totally different set of rules. And when all’s said and done, I think better stories emerge from asymmetric experiences. Hamlet isn’t symmetric… the best stories come from situations with deep differences between the characters. And there’s nothing I love better than hearing great stories coming out of a game of Trove. Tom: That’s are very interesting take on it. I like it and see what you mean. What you said about stories is very true and I had not really thought about it. Hamlet, Coen Bros. movies, the little guy/average joe vs. The Man, all these stories are asymmetrical. Neat. Thanks for bringing that up. Let’s focus on the story aspect of Trove. I love storytelling, when a story emerges from the game itself and how it flows. That’s one reason I like role playing games so much. It’s all about the story. What is the best story you’ve experienced from a game of Trove? Maybe you had to be there, but everyone at the table was dying laughing. The image of these oblivious goblins waving up at an enormous Dragon frustratedly trying to grab them with its massive claws… I mean, that’s the kind of moment you find in a D&D campaign, not in many board games. There have been games where the Dragon has been a step away from escape when the Knight has thrown all its last-ditch efforts to slay it, only to be crushed by a goblin tribe she never saw coming. Times when the Knight has wandered lost in far corners of the cave while the Dragon has devoured hordes of goblins, only for all of them to be crushed by a sudden cave-in that nobody saw coming. Games where all hope seemed to be lost for the Knight until she stumbled across a treasure room where a magical axe lay that allowed her to slay the Dragon in a single strike, to the amazement of everyone. I mean, I could go on and on. There’s a lot of story there. Tom: The KS campaign is phenomenal. $60K+ amazing. You’ve blown up all your stretch goals. That must feel pretty good. David: Thanks! It really does. With a cherry on top. Tom: How did you land the game with Leder Games? David: Patrick Leder of Leder Games found me, actually! I had posted about the game in a Work-In-Progress thread on BGG, which he saw. After looking over the rulebook, he reached out to me about publication. I had a few meetings with other publishers, just to make sure I’d explored my options, but was really excited about working with Patrick because he was so passionate about the game. And his work is 90% of what you’ll see in the finished game—he went from publisher to publisher/developer to publisher/developer/co-designer, because he relentlessly playtested and redesigned systems from the ground up to make it not just innovative, but a pure delight to play from start to finish. Tom: I think that a strong Twitter presence is essential for any game, KS or otherwise, to be successful. You’ve done a good job of getting the word out. How important do you think BGG is to you? David: This game would not exist in any way without BGG. I’ve posted about it from the very earliest days, and there’s a hundreds-of-comments-long thread chronicling over a year of development on the game, from early prototype to publication up through the present. In the rulebook thank-yous, it’ll shout out to our families, a few key playtesters, and that BGG thread… because the game is as much theirs as it is ours. Tom:That is a fantastic thing to say. The art is amazing. I really like the style. Who’s the artist? David: Kyle Ferrin! He. Is. The best. Not only is he a killer illustrator and an absolute pro, he’s a great human being and a pleasure to work with. From the moment I discovered him, I knew I wanted to work with him—I’m so glad I came across his work, Trove wouldn’t be getting a tenth the positive buzz it is without his incredible hand guiding the look and feel. Tom: I’m glad you came across his work too. He reminds me of comic book/graphic novelist Doug TenNapel, which is very good. What one piece of advice would you give aspiring game designers? David: NO ONE is going to steal your idea—so tell everyone you can about your game as soon as possible. 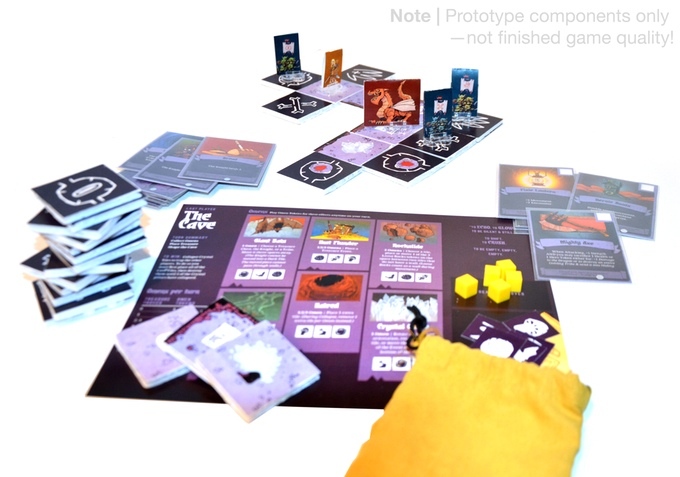 Get it in front of people on BGG or Reddit, as a description, a prototype, a PNP, a video of you playing it, I don’t care. Design in the open. Ideas are cheap, but making a game is hard as anything you’ll ever do for fun. 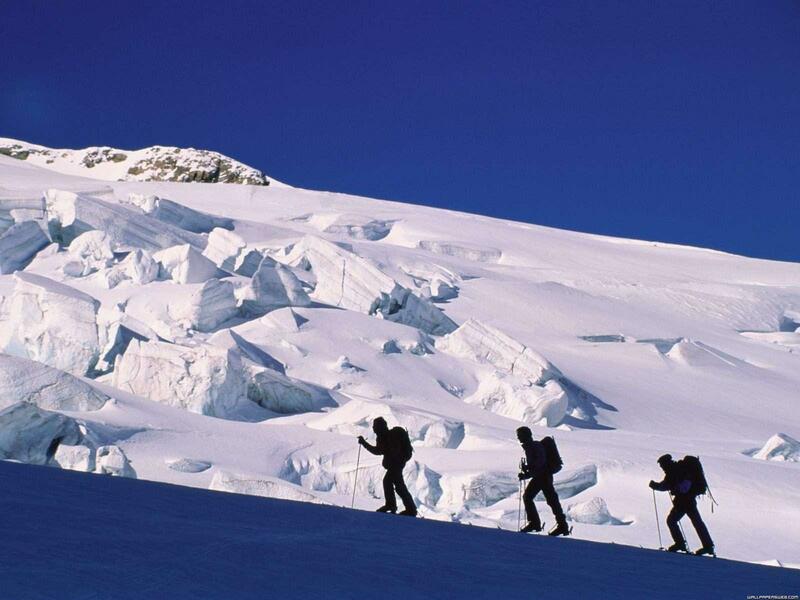 The more you do it where people can see and cheer you on/course-correct you when you’re heading down the wrong path, the better. Tom: That is great advice. Get it in front of people somehow. I struggle with this but can attest that my games have always gotten better because other people played them. David: I think there’s this natural desire to not show your idea until it’s ready. In that case, it’s great to identify the people in your life who it’s safe to show an unformed idea to. There’s one guy I work with who I can show anything to, and he’ll ask all the right questions to make it better, but won’t ever shoot it down. You want to find someone like that, who can help you coax it into existence from the roughest of concepts, without making you second-guess yourself. They don’t even have to be a gamer, they can just be a sympathetic listener. Maybe it’s your dog, I don’t know. Find that earliest sympathetic partner and hang on for dear life. Tom: Such good advice! I am the worst for getting to the prototype stage and not finishing it or not playtesting it. I need to push through that. This board game community is so supportive and helpful. As a designer, not availing yourself to that is a poor decision. How have you tapped into that community? David: Get a PNP up as soon as you can. Or, failing that, just post a video of gameplay to YouTube. You have to get it in front of people so they can react. There’s this bottleneck that exists between the game in your mind and the game in the world. It’s like there’s a game box rattling around inside your head, and the only way to make it real is to pull it out your ear. That’s painful, and it won’t come out the way it was in there (ears aren’t that big! ), but once it’s out in the bright cold light of day, then you can get a good look at it and make it real. So get it in front of people in whatever way you can. And don’t try to make it pretty—there’s time for that later. Make it ugly, make it broken, just make it real, and make people play it. Everything else will work itself out, if it’s meant to be. Tom: I haven’t tried the YouTube thing yet. Hmm. I’m working on taking Go Forth And Game into PodcastLand but that is a bit away. I need to get a PNP up on BGG I guess. I’ve seen another game you are working on, Die Trying. Tell me about that one. David: Ha, that’s kind of a fun side project. It’s a 1–4ish player game that’s almost entirely symmetrical… maybe some variable player powers, but nothing more than that. It’s a little push-your-luck game about trying to climb an infinite mountain with nothing but a deck of cards, a few tokens, a handful of dice, and a gritty determination to survive. Except the experience is built to be like an old arcade game, where you can’t actually win—you’re just trying to get a high score before you die. The core loop of the game is pretty fun… you’re rolling dice to move around a mini-board on cards. I’m talking with a couple of people about whether it should be expanded into a larger game or not, and really can’t say what form the finished title will take. But for right now, it’s great to have a project that’s on a radically smaller scale than Trove. Tom: Ok, it’s similar to If I’m Going Down from VanRyder Games. In that you will die by zombie hands but the goal is to take as many of them with you as possible. Interesting. What is your current favorite game mechanic? Tom: I can see some people getting behind this. TC Petty here is your next challenge! Is there a game designer that you admire? 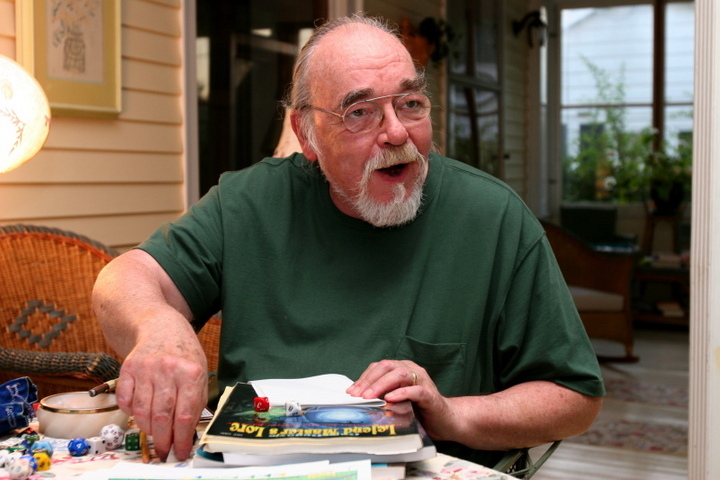 David: Gary Gygax. Turning pure story into pure game is just mind-blowing to me. I can’t think of a more powerful game engine than what he created. 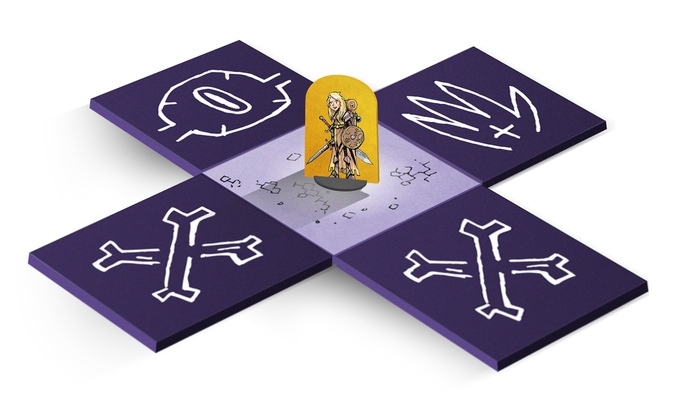 For tabletop, I’d say Rob Daviau, for his Legacy system, and the guys at Plaid Hat for their Crossroads cards. I’m most engaged by designers with Big Ideas… polish and elegance is what makes a game last, but I really love to see the designers who are moving beyond elegance into risky, ground-breaking territory. Tom: Gygax is a great answer. “Turning pure story into pure game…” that’s an awesome way of looking at his contributions. More ground-breaking?! Roll & move renaissance AND do something ground-breaking! Let’s go!! David: Show or movie? If show, then Adventure Time with Finn and Jake. Or anything from the Disney Afternoon in the 90s. If movie, then Beauty and the Beast. I mean come on, it’s a tale as old as time. Tom: So, how can people contact you? David: Twitter! I’m obsessively on Twitter as @thisistrove … except for right after the campaign ends, when I’ll be off the grid, traveling with my incredible wife. David: I regret that I have but one interview to give to this blog. We who are about to sign off salute you. Tomorrow is another day. There is another Skywalker. Take your pick of any of those. Tom: Last question: In a bake off who would win: Aunt Bea or Mrs. Cleaver? David: I love me some Andy Griffith, and my youngest daughter is named Bea—so I gotta give a solid win to Aunt Bea on this one! Tom: Thanks for being my guest David. It was fun. 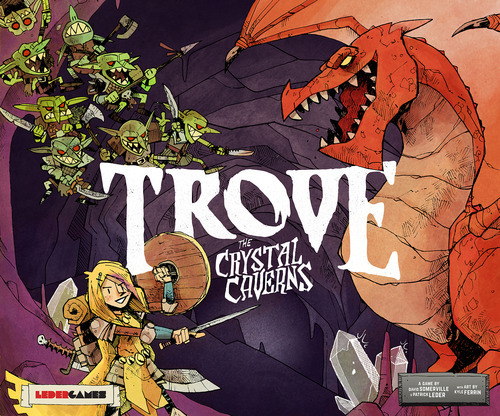 I’m very interested in Trove. It sounds like a lot of fun. Readers, please consider backing Trove. It’s sitting at $78K or +400% its funding goal. So it will be made. You’ll get a pretty cool game. Thanks for reading. Come on back now, ya hear!